I've had my disturbed, fountain pen-obsessed eyeball on this gorgeous pen for awhile now. I am ever so lucky that Levenger generously sent me this beauty to review. Thank you kindly, Levenger, for this opportunity! Levenger pens are nicely packaged. They arrive in a cardboard sleeve, with a green Levenger box inside. The hard Levenger box opens up to reveal a felt bed with the pen held down by a soft strap, along with a cartridge and a converter. 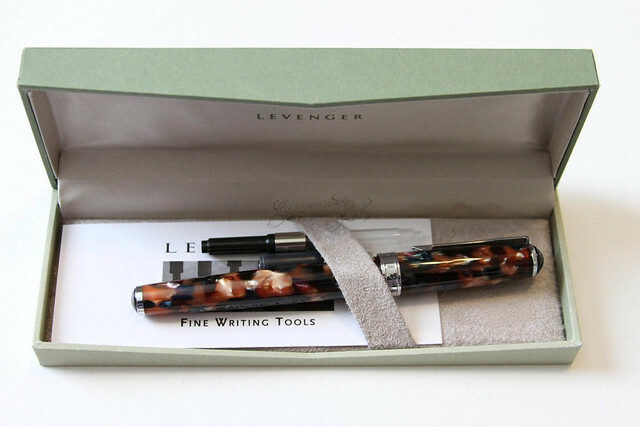 I like that both are included - something I would hope for and expect at this price point, but I also appreciate that Levenger provides both nevertheless. However, while I think the box is nice enough, space is limited in my work area so I won't be keeping it. 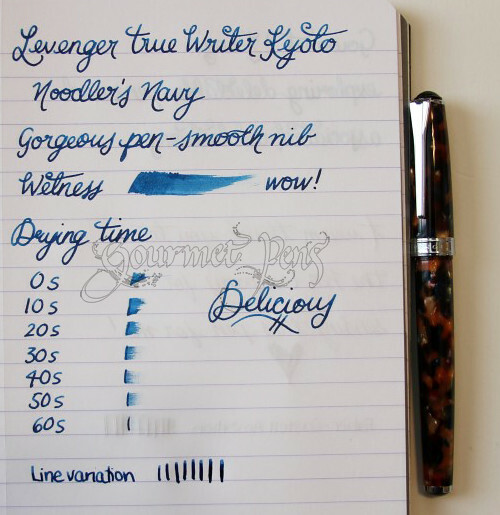 The Levenger True Writer shares the same style and shape of body with the other True Writers. It is a fairly simple design - just a regular body with a threaded cap, friction post, a clip, and a metal center band. Where it pops is its incredible material. The resin is a multicolored dream - with a yellow/orange/brown base, and flecks of gorgeous blue and violets along the body, it's some sort of eye candy. Or just candy. It's almost hard to describe and it's even harder to capture in photographs properly. Sorry for the shadows and generally bad photography - I was trying to capture the colors and flecks. The center band is engraved with Levenger, and True Writer appears to be screened. It's a nice touch, and is not over the top, nor does it look cheap. The only thing I do not like is where the center band is placed on the cap. It's not actually at the end of the cap, which would give the appearance of splitting the pen up at the cap and barrel. Instead, it's slightly higher up on the cap, so there is some more resin below it. It is visually confusing and makes the cap appear shorter than it actually is. Minor detail though. Note the location of the center band. 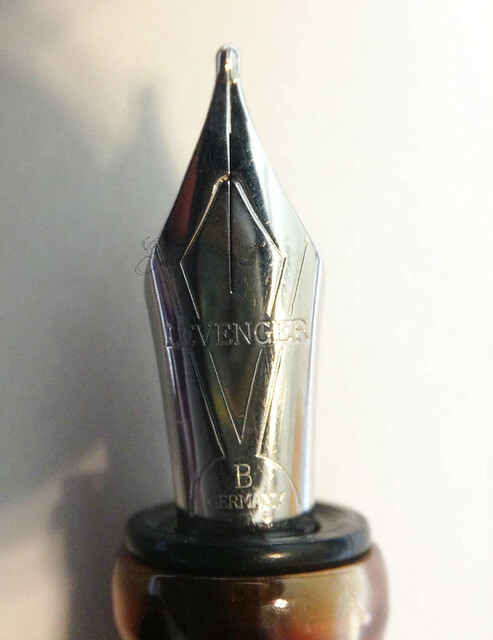 The Levenger nib is not the most beautiful to look at; it is rather plain and simple. The steel nib is simple and has a few lines on it, basically. The broad nib is delicious though. Yes, I used the word delicious. I can easily ignore the plain appearance of the nib because I simply love the writing experience with this juicy broad nib. The nib is a wet writer, and it's good and juicy. Ink flow is consistent and keeps up with the broad nib's demands. The lines are thick and inky. 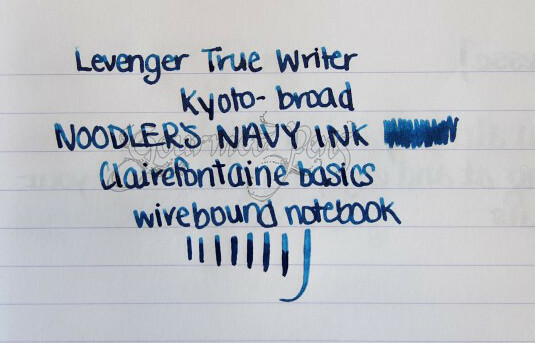 While writing, you can see the ink gleaming until it dries. I really, really like this broad nib, and I'm glad I took a chance and opted to go broad instead of picking my usual fine or medium. In terms of line variation, keep in mind it is a stiff nib, even though it's so juicy. With pressure, line variation can certainly be achieved. Given the nib is so juicy, ink flow does keep up. It's definitely not a flex nib though, so don't expect it to be one. You can't write with the amount of pressure needed to get much line variation. The True Writer Kyoto is a lovely pen to hold. It is not too heavy, and it is a perfect length, both uncapped and posted. The cap is not very heavy so when it is posted, the weight and balance does not shift too much towards the back of the pen (something I hate), so it is quite comfortable to write with. The nib is so smooth and little pressure is required to get the ink flowing, therefore it's just easy to write with this pen. No effort is involved - you don't have to grip the pen tightly, you don't have to press hard on the paper or tap the nib to get it going. It's just simple and straight forward. That combined with the weight and balance makes the whole experience pretty darned awesome. Stunning to look at! Beautiful appearance! Very comfortable pen to hold and write with. Great weight and balance to the pen. Sometimes difficult to cap because threads are tight - just requires some effort. This is improving as the pen gets broken in. Location of center band is aesthetically wrong to me, by a few millimeters. I have read the one star reviews on Levenger's site for this pen and it boggles my mind how people have so many issues with this pen. Maybe they got defective pens, in which case I am certain Levenger would have replaced it - as any good company with proper customer service would do. I did not have any of these issues that people are writing about - no nib breakage, no splatter, no skipping from lack of ink, no hard starting. Nothing of the sort. I have received nothing short of a pleasant, smooth, delectable writing experience. I did not tweak this pen to achieve these results, and given Levenger's guarantee, I feel it is safe to recommend this pen to you, not only for its beauty, but for the writing experience as well. The Kyoto body is also available in a ballpoint and roller ball, if fountain pens aren't your thang. Does This Pen Make Me Look Fat? This gorgeous fountain pen was sent to me by Levenger for reviewing purposes. I was not compensated monetarily, and all opinions you have read here are 100% my own, I promise. Swear on Tyco's life. Isn't it gorgeous? It's so hard to convey through pictures. It's seriously stunning though. And you're right - broad nibs have really grown on me lately. I need more!!! I went to Levenger and it's only available in F and M, bah! If you want to try a cheap, sweet, broad nib, get a Kaweco Sport BB. Luxurious, juicy and smooth, one of my favourites. The B is no slouch either. The broad is delicious but not inexpensive enough for me to have a few lying around, which I'd really like! I finally got a Kaweco sport broad! I didn't love it much with the Kaweco blue cartridge but once I used my own ink, it became waaaaaaay better! Wish I had gotten the BB now.... may have to spring for that one next! I have a TrueWriter from Levenger and love it! I've never had problems with my pen and I've abused it shamelessly. I went with the stub nib and it has just enough to give it a touch of interest without making it hard to write with. Ahh the stub! I heard it's a great stub actually. Good thing the nib units are interchangeable - I will have to try one sometime :) I bet it would be fantastic on this pen.. yummy! Hmmm the top of the clip design looks an awful lot like the Sailor clip design... curious. Me too - that was exactly why I was so hesitant. That said, this is now my second Levenger and both have been great writers. The first was the L-Tech and it writes even better the more I use it, but it never wrote poorly to begin with. This one is just a smooth dream to write with. Between the two, I'm surprised that there are so many negative reviews out there. Who knows though, maybe my third will be a dud. I hope not though. I'm really happy with my experiences so far. That looks like a really pretty pen. I´ve been tempted to get one myself. Seeing that it is a wet writer, I presume a F nib would be closer to a FM? Would you describe the nib as smooth? I read somewhere that these pens are about 18 grams unposted - which is perfect! I love light-weighted pens. I second that. I have three... still thinking of getting more...yikes. Oh no!! Silly question but have you tried soaking the whole section & nib unit in water and a touch of dish soap to get that flush that dry ink? I have had a beautiful Kyoto fountain pen for several years now (5+) and I have really loved writing with it until recently. I went to change the nib (using Levenger's multi nib optional pack) and it was so stuck that the nib section pulled out of the material it's seating in. That material has disintegrated to the point where a) it will no longer hold the nib in place and b) it absolutely cannot be twisted out or otherwise separated from the grip section of the pen. 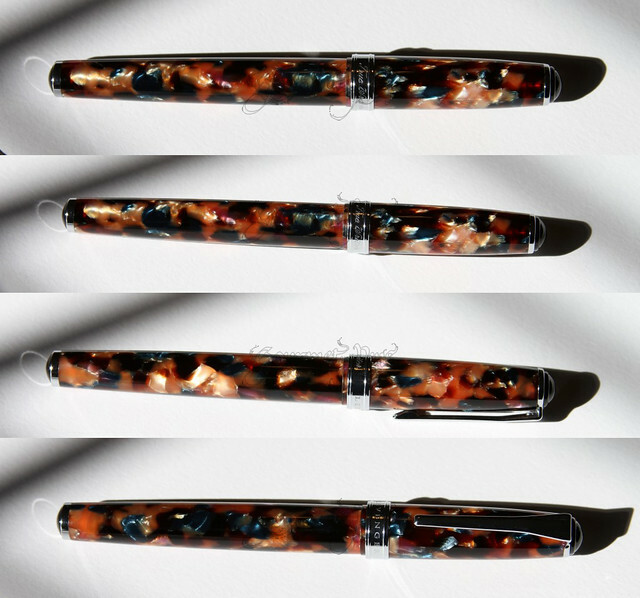 My Kyoto was so beautiful - I love the tortoise shell like resin finish, but it is absolutely unusable now and I fear I will have to throw the whole pen away! Give the section a soak in a glass of water, with a teaspoon of household ammonia in. That will loosen up any dried ink, etc. and then maybe you can get the rest of the nib holder out. If that doesn't work, I would contacf Levenger. I'm pretty sure you can get a replacement section from them. It's too nice of a pen to give up on. I bought one on sale last year, and I love it. I find the nib (a fine nib) surprisingly smooth--much nicer to write with than, say, Monteverde nibs. 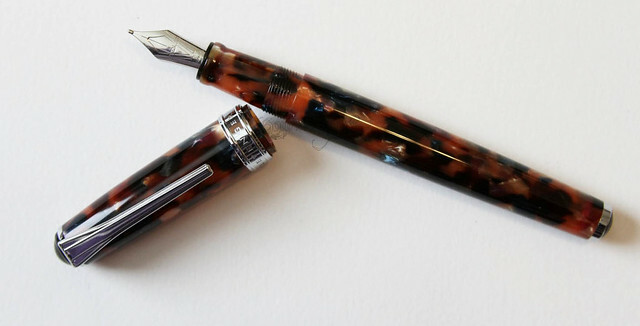 Since buying this one, I have picked up an older demonstrator from isellpens.com (in a medium nib), and I have purchased the Purple Mountains Majesty and the Fall Foliage one. I find the Fall Foliage fine nib even nicer than the Kyoto's. I'm not sure why that should be, but it is. The nib on that one is also a two-toned one, so it is a bit prettier. Hey there. You want to remove the nib and feed from the collar, you mean? I think they are just friction fit so you should be able to pull them straight out. If they're dirty, as you think they might be, it could be ink crusted in that's making it hard to remove them. You could try soaking it for awhile then using some grippy material to hold the nib and feed and pull it out. Thanks for the lovely reply! I'm of the impression I've done the best I could but then what do I know...is there such a thing as soaking it too long? Oh and yes thank you...the collar! I didn't know what to call it!